Townhome, 3 Bedrooms + 3 Baths. Sleeps 8+ everything you need included. Harbor Town only a 5-8 min. walk. Pool is across the pond over the bridge. This will become your home away from home. All 3 bedrooms have their own full bathroom and a TV. Every thing you need while staying at our villa is there for you. Eileen is a retired high school teacher special ed. ,and I am a retired yacht broker. As we both love sports and the water, we can do all here, bike, tennis, golf, swim, and boat, all year long. We both grew up in Chicago and now live in Park Ridge, Il. Two children and 6 grandchildren. We startedd with a timeshare,just loved coming here with the kids and grand-kids. So we just bought and have loved it ever since. Our home away from home. Ocean, beach, biking on the beach, tennis, golfing, walking, and boating. And there are great places to go eat. Best of all just sitting on the deck and watching the wildlife while you enjoy a glass of wine at the end of the day. can be viewed from the deck. Beach towels are not included you need to bring your own. A repeat client who is a chef says one of the best. Rental discounted with rental- Riding Tigers Bike Rentals 843-686-5833 need to mention our property for the discount. Over looks the lagoon at other end is the first fairway of the Heritage golf course. One of the largest in Sea Pines for our complex use only. Parking Passes will be called in prior to your arrival, Max. of 2 per week. The pass must be displayed on your dashboard at all times. Failure to display may result in towing of vehicle at renter's expense. We also have a mechanical engineer for inspections and any services that may be needed. We had a wonderful time at this villa. Have been coming to the island for over 20 years. (Shoulda bought a place) We have stayed in another villa in the same complex and we enjoyed this one a lot more. The lagoon view, with birds, turtles and a gator added to the vacation vibe. The short walk to Harbor Town with the July 4th fireworks, awesome!! The bathrooms are so updated, I almost didn't want to leave!! Don't cook on vacation, but the kitchen had everything you could ask for! This one is definitely on our return list. Every thing you needed was all in the unit. And was vary clean. Pool in complex just for the complex vary large. 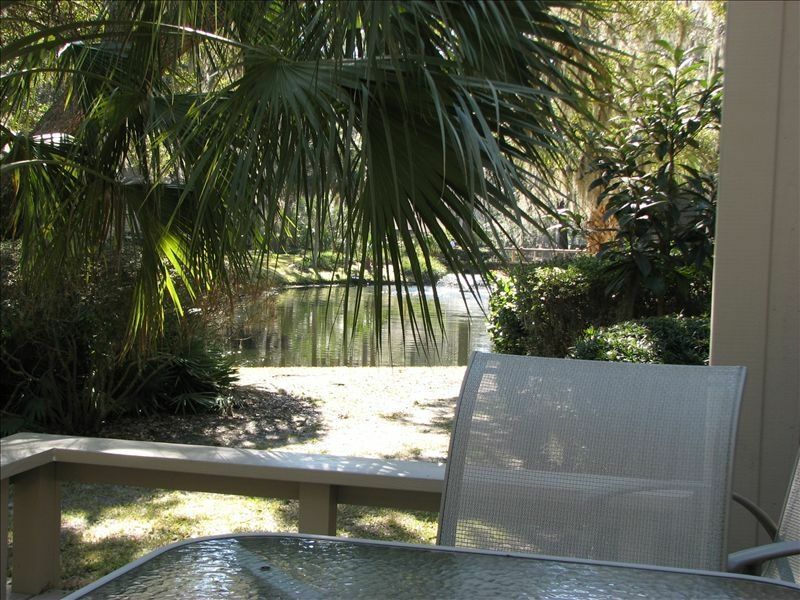 Easy walk to Harbour Town, Tennis and great bike trails. We were very happy with the condo. It had every thing that was needed in the kitchen. It was clean and in a good location. If and when we return to HH we would consider renting it again. We try to make everyone feel it is a home away from home with everything they need to relax and enjoy. New Years in Harbor Town.Thank you. Herb was a pleasure to work with. I had a question about the Wifi and he responded very quickly. The condo is spacious and updated. Location is about perfect, close to everything but not so close that you get in the noise and hustle that happens in HarborTown sometimes. Sea pines is my favorite place in the world and we enjoyed our visit to this condo. Bike paths, beach, great restaurants, pool and shopping. What a great place. Thank you for your review. Eileen & I are glad you enjoyed your stay and we hope to see you in the future. Herb and Eileen's villa in Sea Pines is outstanding. Great location and very well maintained. Some nice upgrades to the kitchen, showers, and flooring. The villa is perfect. A nice size to enjoy your vacation. Highly recommended. Very close to Harbour Town and Beach. Trolley and bike paths are wonderful, don't need to drive. We really enjoy the villa, only wish we lived closer. Love Hilton Head Island! Thank you for the kind response. We try to have our villa equipped with all your needs. So you can have a relaxing stay. We have discounted bike rental at Riding Tigers Bike Rentals, just mention Heritage Villa 2255 Discount. FOR ALL INQUIRES WE MUST HAVE NO. IN PARTY AND PHONE NO. CALLS IN THE USA OR CANADA on the house phone are free. WiFi is secure and free. Inc. one car pass. ++++You may also send part payments so as not to have one payment 30 days before arrival.